Artur joined WD Capital Markets in 2012 and is currently a Managing Director with the firm and President of WD Numeric Corporate Services. He focuses on helping clients with their corporate finance, going public, and private business and M&A advisory needs. Artur has an entrepreneurial background having founded, operated and exited several small businesses while earning his undergraduate and graduate degrees. He currently owns an automotive dealership and financing company, and leads an accounting and corporate services company with a staff of bookkeepers and accountants. Artur brings an advisory and management background rooted in a unique combination of business, finance and legal expertise to advise clients in a broad range of industries from technology and telecom to real estate and financial services. 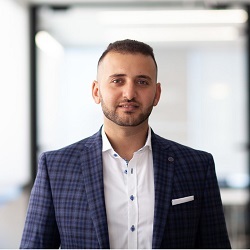 Artur graduated with a BA from York University in 2008 and a joint JD/MBA from Osgoode Hall Law School and Schulich School of Business at York University in 2012. He was called to the Ontario Bar in 2013.